I am a big fan of lighthouses. They set an idyllic seaside scene, while offering unconditional light in the darkness to guide those navigating rocky waters to safety. Setting a good example to us all! 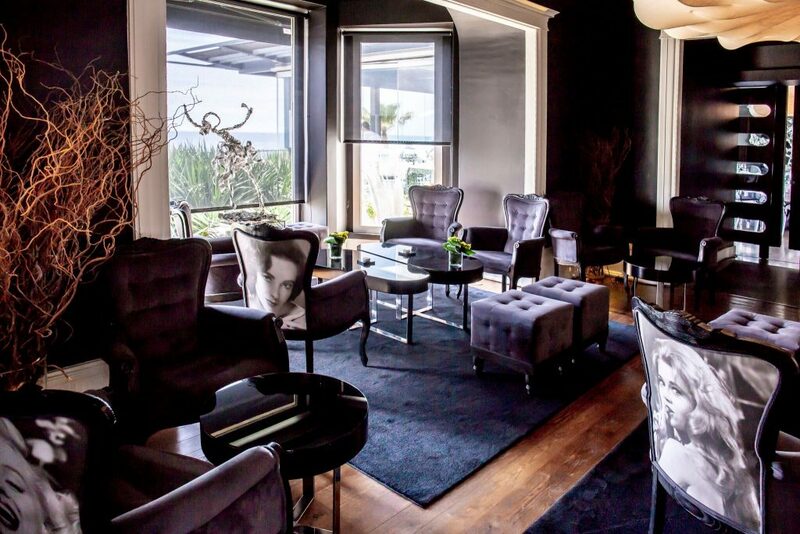 So, may I guide you to a 5 star refuge for the most discerning of sailors on the waters of life: Farol Hotel. Sitting right next door to a picture postcard perfect blue and white striped lighthouse, and continuing its offering of light and romance. 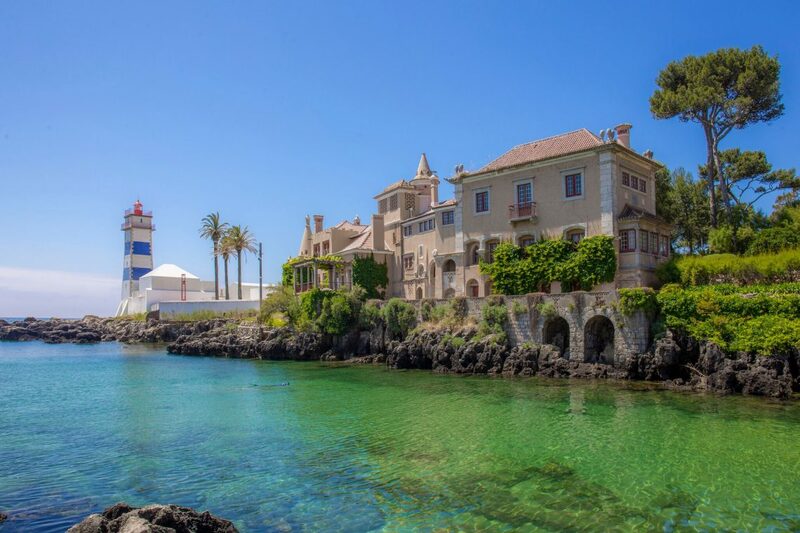 Farol is a boutique hotel in a remodelled 19th century private mansion, built in a time before planning permission existed, when no one batted an eyelid if someone decided to construct a properties that close to the Atlantic coast. 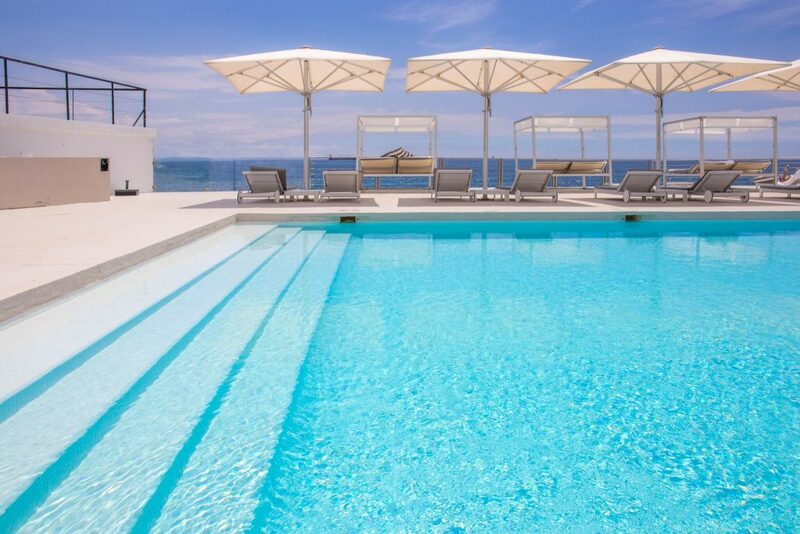 Meaning this historic house has unrivalled sea views from all the open planned spaces of the hotel and pool deck. The latter only separated from the jagged rocks of the coast with a low clear glass wall. Which in winter, the sea crashes over, right into the filtered Atlantic sea water pool. Bringing the outside in, in more ways than one. With 33 rooms the hotel is a winning formula of old and new (also just the right size to use as a sea view wedding venue). The original house, once owned by the Count of Cabral, features classic bevelled glass doors and original high ceilings, offset against original Marcel Wanders Zeppelin lights. Which look like something out of a David Cronenberg movie – in a good way. There are also art exhibitions of unique painting and sculpture by Cascais talent exhibited throughout, which change twice a year, with a private view that is quite the local social event. 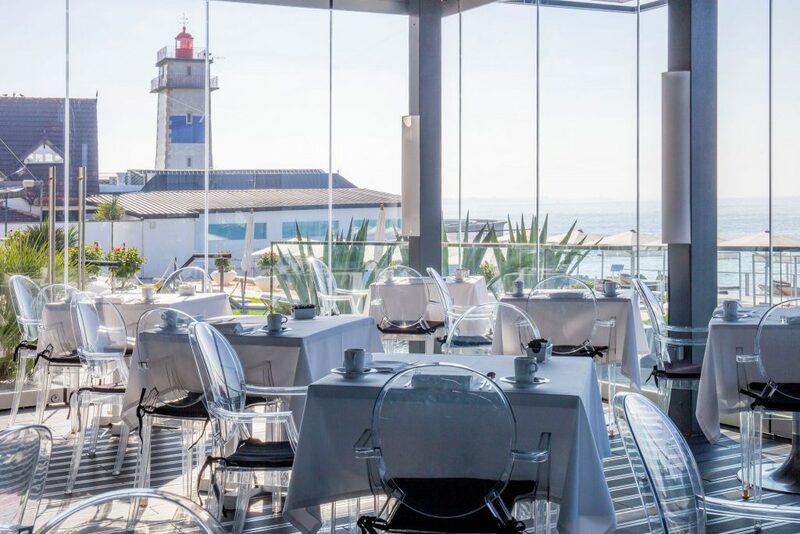 The architecturally designed new wings host two restaurants, with floor to ceiling windows overlooking the ocean. Flooded with light during the day, The Mix is where breakfast is served, with self serve Nespresso from the industrial size machine and fresh tangy juices, scrambled eggs are spot on creamy. While there is also quite the assortment of the usual fruit and pastries. Omelettes and pancakes are made to order and it’s well worth a little restraint to leave room to order a fresh waffle to have with the berries, walnuts nuts and yogurt on offer at the buffet. We returned to The Mix for lunch one day and I ordered an incredible ginger infused risotto with sautéed lobster. While my partner enjoyed roasted sea bass with pistachio purée and a delicious carrot and celery pie shaped puree, finishing with coffee and warm mini Pastel de Nata, the local speciality pastry. 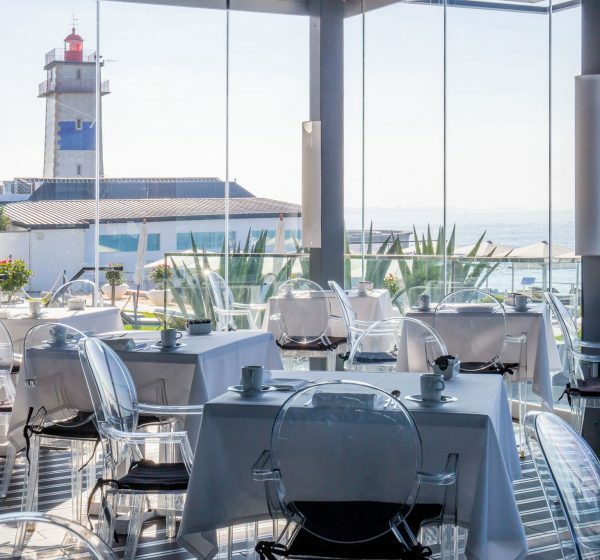 In the evenings, when the noble lighthouse starts blinking next door, Farol’s stylish lighting systems gradually come to life. The under-lit aqua pool surrounded by ultra violet plant pot lamps, creating an elegant mood for dinner in the Farol’s renowned sushi restaurant, Sushi Design. 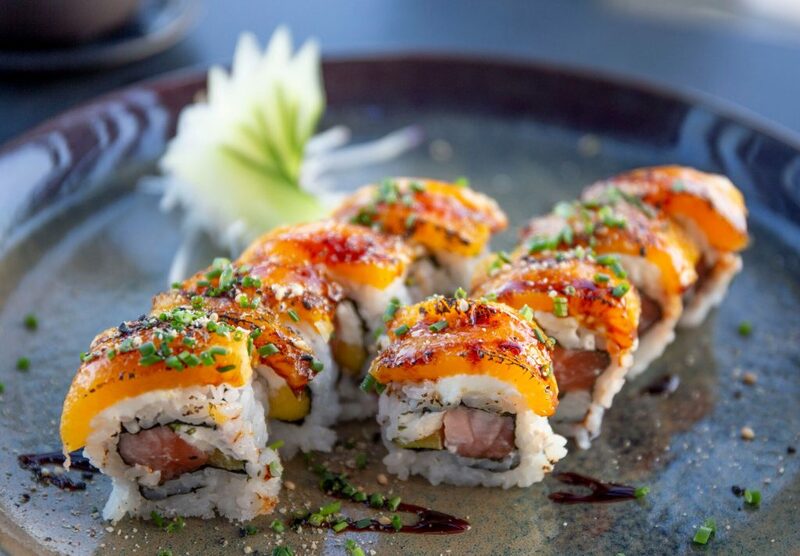 Voted the best sushi in Portugal by Time Out, it is really not to be missed. 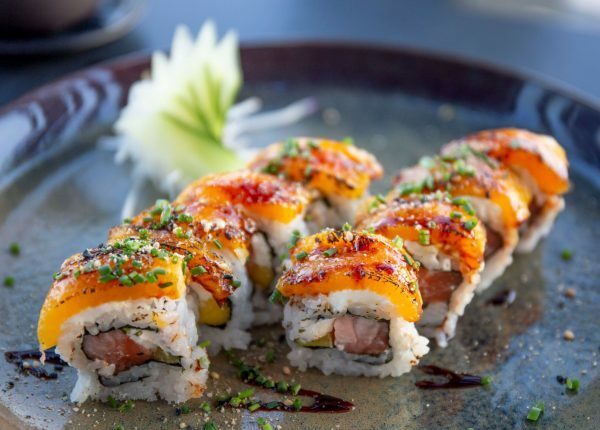 Choose from strawberry maki, crunchy dragon and exotic tiger rolls, garnished with ikura (salmon roe) and wrapped with seared salmon teriyaki, avocado slithers or crispy burnt orange skins. Try the tuna belly with fatty veins that melt in the mouth, and an aphrodisiac sashimi with a sake ponzu oyster sauce. Wash it all down with sweet and sharp sake mojitos and be thankful there is not far to go afterwards! The Farol suite features high ceilings, wooden floorboards and my highlight: a mosaic tiled alcove featuring a huge bubbling hot tub (in which I may have gone a bit overboard with the aptly named ‘RITUAL of the happy buddha’ bubbles that were provided). A large rain head shower sits over the tub tub allowing for a shower with a sea view. And watching the sailing ships passing by made me realise what’s missing from my bathroom at home. I mean the dream. 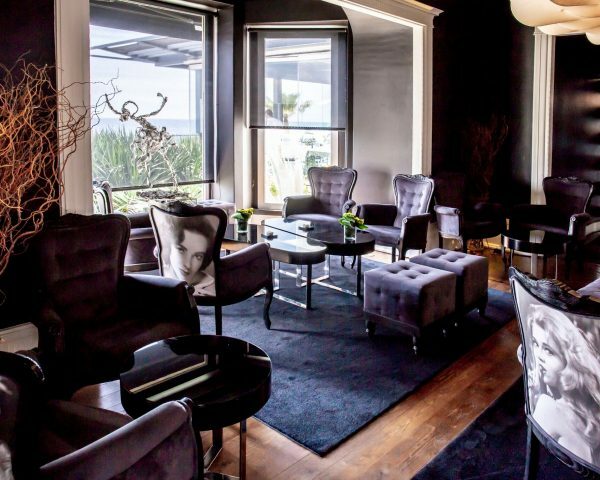 Farol is in a great location with a short stroll to the charming town of Cascais, with its many eateries, boutiques and cultural centres. If you are fond of sand dunes and salty air, make use of the hotel bikes to explore in the other direction too, where the dramatic coastline leads to wild beaches and stunning sunset cliff-top views. 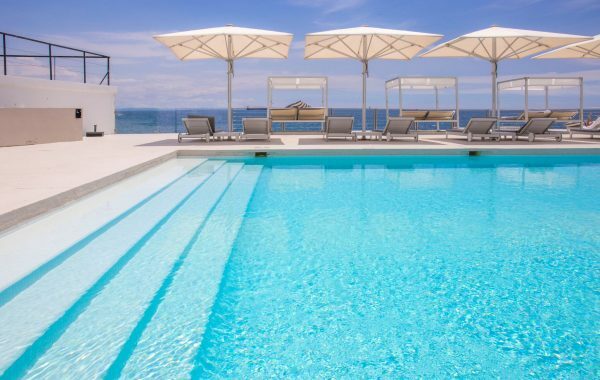 Otherwise you can just contemplate the unfathomable vastness of the Atlantic ocean from loungers on a private balcony or by the pool. Already a wonderful wellbeing sanctuary in its current incarnation, rumour has it that there are plans for a Farol spa and wellness programmes from 2019, and with the GM Ana Maria, being the woman behind Chiva Som, expectations are up there for something seriously special. And I for one will be watching that space closely.